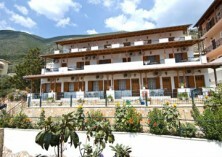 The studios are located on the south west side of the island, in Ponti settlement, near Vassiliki village. You can enjoy there the marvellous view of Vassiliki’s bay and of the Ionian Sea in general. Ponti is only 38km away from the town of Lefkada and approximately 55km away from the airport of Aktio. The village of Vassiliki is 1km away and there are all kinds of shops, such as traditional art shops, travel agencies, traditional greek taverns and night clubs. There is also a harbour which connects Lefkada island with other islands of Ionian Sea. The studios are 30m away from the seacoast and only 100m from the sandy beach, whose shallow waters are ideal for children. Furthermore, this beach is one of the best destinations in the world as far as wind – surfing is concerned.